Add One-to-One sessions to any EC course, and maximize your progress through private lessons. With individual attention, these sessions are 100% focused on your requirements and designed by your teachers to match your specific needs. No distractions: just you and your teacher. Your lessons will be designed to fit your needs exactly and in this nurturing, supportive environment you will receive your teacher’s undivided attention, as well as feedback, encouragement and motivation. From helping you understand the grammar point that has always confused you to learning English specifically for the trip you are planning, the flexibility and expertise of our teachers allow you to choose the English that you want to learn. Continuous monitoring from your teachers enables them to identify the areas you specifically need to work on in order to progress. Together with your teachers you will address your weak points and work to strengthen them. It’s easy for you to relax and learn in our friendly classroom environment. You don’t have to feel nervous about talking in front of classmates. This is a great opportunity to become more confident in the classroom. Take advantage of the interaction found on a group course and the personal attention of One-to-One classes. 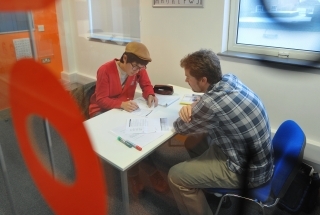 You may combine One-to-One lessons with a group course for a well-balanced approach to achieving your English goals.